The USB-NET-4A provides the scalability to quickly adapt devices to new USB technologies. 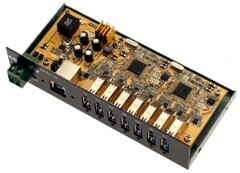 Multiple modules can be added to Ethernet interface allowing you to add USB connectivity as needed. Complete product line offer many choices help you to expand and make your network grow with your requirements. With the USB Plug-and-Play feature, simply plug in, follow the instructions of Install Wizard, and then you are done. You don’t have to deal with Card Slots, I/O address, IRQ jumpers, DMA and others when you are connecting the USB devices. The System will recognize the device and install the drivers automatically. The NET-USB-4A is an ideal solution for your expanding applications. (L) 5.98�? x (W) 2.36�? x (H) 1.03�?